Below is an ad that I found for the Hudson and Graham Funeral Home that catered to African Americans. This ad was featured in the 1958 Haywood, Lauderdale, and Tipton County Directory. It’s unclear who exactly Hudson and Graham are and because this is an ad for 1958 I am unable to turn to the census to do a quick search. Does anyone remember the Hudson and Graham Funeral Home or where it might have been located? The Graham in “Hudson Graham” was Alexander Graham Jr. Originally from Haywood County, he was a first cousin to James Edward Ashton who died 1956 in Ripley. Alexander’s mother was Cherry Barbee. The funeral home still operates in Dyersburg, TN as Hudson Funeral Home on Cheatham. Correction to earlier post. Cherry Barbee was Alexander Graham Jr.’s grandmother. Cherry’s daughter Mariah Barbee was his mother who married Alexander Graham Sr. Thanks for commenting. I had wondered if the Hudson Funeral Home in Dyersburg was somehow related to this one. 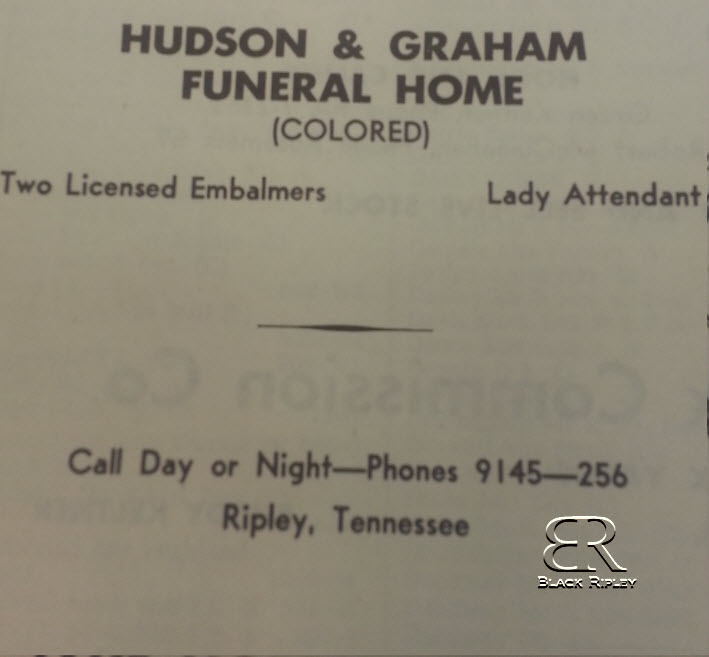 The Hudson & Graham Funeral Home was located in Ripley, Tn. on Barbee St off of Scott Dr.
I’m the great grandson of Alex Graham, he was my mother’s grandfather on her mom’s side. The funeral home was located downtown Ripley across from Thompson’s Mortuary. My grandfather left the funeral home to my uncle Harold T Owens. But he was ran out of town and the funeral home was closed when they had the riot of 69 if I’m not mistaken. He did put Mr. Henry Hudson through school for funeral director, and Mr. Hudson offered to do the same for me, because it was a promise he had made to my grandfather. But I declined his offer, but was most grateful. Thanks for everything, and keep up the good work. Thanks for sharing your family’s story. Chris Blanden, I have a pic of “The Hole” in Ripley, but I don’t see how to post a picture. Hi Sandra, You can email the picture to tiffany@blackripley.com and I’ll post it for you. I pull live to share it with my mother an any other pictures you may have. I am also working on a Lewis Ware family whose daughter Florence Ware Wright Lee has some link to Cordelia Johnson Davis Clay Family of Ripley. Florence was born in Haywood County but moved to Lauderdale where she died in 1947. Very Interesting A Ashton. I’ve ran into those names as well but havent linked them to my Ware family. You mentioned Cordelia Johnson and My family is Monroe Ware whom married Annie Johnson who both died in Lauderdale County, TN. Does those two names ring a bell? Is This the Murder of Richard Thurmond?